Circadian rhythms are the natural biological rhythms that shape our biology. Most people know about the master clock in our brain that keeps us on a wake-sleep cycle over 24 hours. This is driven by our master “clock’ genes. There is some pretty cool terminology involved in chronobiology (a nifty term for the study of biological rhythms) that you will want to be familiar with before digging into the research papers on the topic. 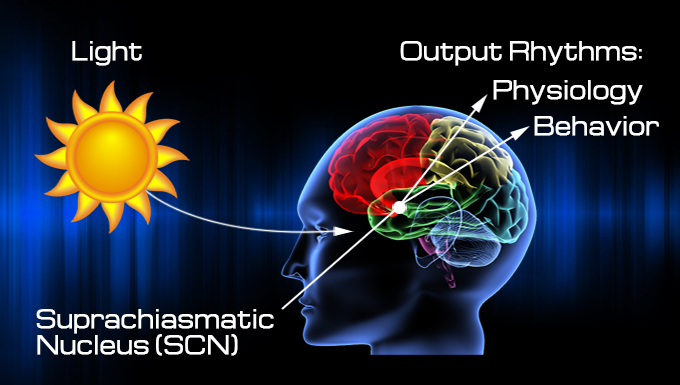 The part of the hypothalamus that controls the central clock is called the “suprachiasmatic nucleus” (SCN), which sounds a little sci-fi to me. And the external environmental inputs, like the time the sun rises or lights at night, are known as zeitgebers. 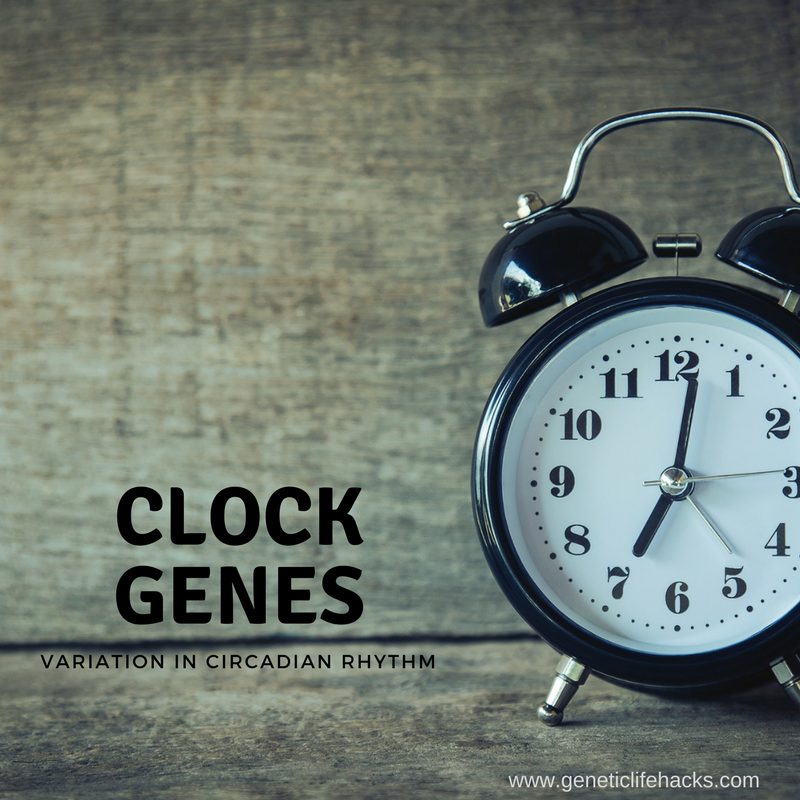 Some things are named more predictably, like one gene controlling circadian rhythms which is called the CLOCK gene ( an acronym for Circadian Locomotor Output Cycles Kaput). It is probably not a big surprise that our core circadian rhythm is set by sunlight since night/day rhythms can be seen in all animals. In a nutshell, light from the sun in the short, blue wavelengths hits receptors in the eye (intrinsic photosensitive retinal ganglion cells) which signals to the suprachiasmatic nucleus synchronizing the circadian 24-hour cycle. There are two factors that can mess up our circadian rhythms: light at night (specifically, blue wavelengths ~450-480nm) and lack of sunlight in the morning. Add to that the individual genetic variants that affect our clock gene functions and you can begin see the importance of this topic. So what happens when our circadian rhythms go askew? The effects can be far ranging and include increased risk for the following: diabetes, cardiovascular disease, certain cancers, mood disorders, and obesity. The amount of scientific research coming out on the topic in the past few years is astounding. While not talked about much in the mainstream press, the evidence is strong enough that in 2007 the IARC (cancer research arm of the World Health Organization) listed chronic exposure to light at night as a possible carcinogen. Circadian rhythm is at the base of good health. Blue wavelengths set circadian rhythm. Sunlight in the morning is good; blue light in evening alters the circadian system. The CLOCK and BMAL1 (ARNTL) genes are the core clock genes that target and turn on other genes. They are regulated and turned off by rising levels of the cryptochromes, CRY1 and CRY2, and the period genes, PER1, PER2, and PER3. [ref] This forms the daily feedback loop of rising CLOCK and BMAL1 that are then inhibited by rising levels of CRY and PER giving a 24-hour rhythm. 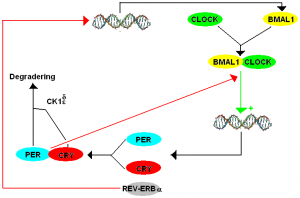 BMAL1 binds with CLOCK to increase the production of the PER and CRY circadian genes. One of the BMAL1 variants, rs3816358 (A is the minor allele), has been studied in reference to breast cancer risk, cardiovascular disease risk, and diabetes risk. PER1 codes for the ‘period circadian protein homolog 1’ protein which, along with CRY (below), is the other half of the core genes involved in our circadian rhythm. A study in 2012 found that a variant, rs7221412, altered the natural timing of activity. Those with the A/A genotype may naturally wake up about an hour earlier than those with G/G, while A/G falls in the middle. Blue light at night has a big effect on your circadian rhythms. (Read my melatonin article). Blocking blue light in the evening for a few hours before bed with blue-blocking glasses is one solution that will have multiple positive benefits on sleep and circadian rhythm. Get some inexpensive orange safety goggles and wear them every evening. Or upgrade to some nicer looking blue-blocking glasses. This seriously makes a difference in sleep quality and circadian function. Even dim light at night can affect the body. A study found that after two weeks with dim light during their dark cycle, “mice gained significantly more mass, reduced whole-body energy expenditure, increased carbohydrate over fat oxidation, and altered temperature circadian rhythms.” [ref] So get some light blocking curtains, put electrical tape on any LED charger lights, and sleep in true darkness. For those with melatonin receptor variants, eating dinner earlier can significantly decrease the risk of type 2 diabetes! N-acetyl-cysteine (NA/C) reversed the effects of BMAL1 deficiency in mice in regards to aging and oxidative stress. Additionally, “Bmal1-deficient mice that received NA/C weigh less than the corresponding control animals drinking regular water”, but they also drank less water. [ref] This may be something to look into more as far as the timing of when it is best to take NA/C. You can turn on an accessibility feature on iPhones to set up the phone to do a complete shift to red light. This is a handy feature if you need to look at your phone for some reason during the night. Turning on a color shift to red on iOS phones. There is an incredible amount of research coming out about the impacts of disruptions to our circadian rhythms, which has convinced me that this is one of the most important bases for good health. Significant increases in the risk for breast and prostate cancer have been tied to being exposed to light at night, as well as increased risk of metabolic syndrome and diabetes. Personal update: While I’m not ready to go back to using candles for illumination in the evening, I am rocking the orange glasses every evening and sleeping like a rock each night. Plus I’ve moved my evening meal earlier (5:30 or 6 pm) and cut out snacking at night to give my body the signal that the day is done. All of this has resulted in weight loss without cutting out calories or changing my regular way of eating.